Yesu Garden: Is God Fair? Sometimes it seems like life itself is preying on you like these two mini predators I clicked . We have the occasional stray dog rifling through our space and of course there is Naughty ( the neighbour 's feral dog - can one get used to irritants like him ? 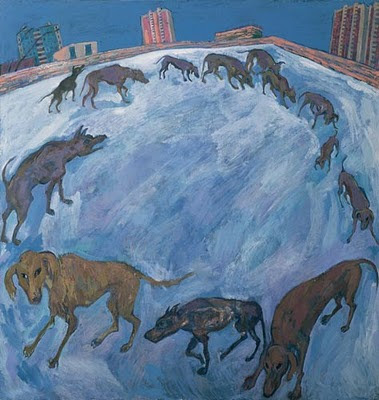 I like this painting of stray dogs done by an European painter. need immediate surgery. He has prescribed some eye drops and vitamins for a month, then he will check her again. Namrita , her husband and younger son are all down with Chikungunya. They are some better. Family and friends are by their side. Thank you for your prayers. 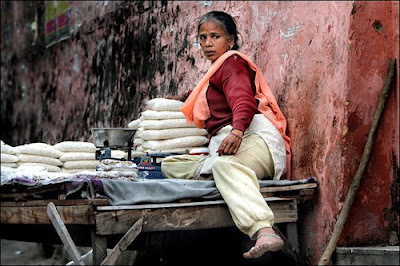 Reading my blogfriend Kathryn 's post set my thoughts in motion about the fairness of God. Is God fair?. No He is not, according to our limited human perspective. But He is right , just and merciful. If He was fair, we would have received our just desserts and all perished because we all like sheep have gone astray - lost in our sinfulness. But God who pronounced judgement on us provided the penalty too. The death of Jesus on the cross - an atonement for our sin. Here is an article on the fairness of God. Answer: Fortunately for us, God is not fair. Fairness would mean that everyone got exactly as he or she deserved and everyone would be treated the same. If God were completely fair, we would all spend eternity in hell paying for our sin, which is exactly what we deserve. We have all sinned against God (Romans 3:23) and are therefore worthy of eternal death (Romans 6:23). If we received what we deserve, we would end up in the lake of fire (Revelation 20:14-15). But God is not fair; instead, He is merciful and good, so He sent Jesus Christ to die on the cross in our place, taking the punishment that we deserve (2 Corinthians 5:21). All we have to do is believe in Him and we will be saved, forgiven, and receive an eternal home in heaven (John 3:16). All have the opportunity to respond to the revelation of the creation (Psalm 19:1-3), as well as the conscience God has put within them (Romans 2:15), and turn to God. Those who do not will receive what they truly deserve because of their rejection of Him. Those who reject Him receive the punishment they deserve (John 3:18,36). Those who believe are receiving far more, and much better, than what they deserve. No one, though, is being punished beyond what he deserves. Is God fair? No. Thankfully, God is much more than fair! God is gracious, merciful, and forgiving - but also holy, just, and righteous.Recommended Resource: Knowing God by J.I. Packer. HERE IS ANOTHER ARTICLE on the above subject. It refers to the parable of the hired workers. Of course..His character contains no evil or sin. He is just and wrathful..and of course loving and faithful. Amen Abigail. Thank you for visiting me. I agree that everyone deserves to go to hell because we are all sinners. Fortunately God is good and merciful. He gave us His only begotten Son to die for the sake of our sins. I believe God loves everybody and desires each person to love Him, but not everyone is willing to do that. I believe life can be very unfair. But it is better to suffer and be holy in this life, than receive punishment in the life hereafter. I think that God is fair, but people too often look on the world only from their human position. Wow, Amrita. You said this so much better than i.
I really like the last article you linked to, also. My hubby & i have been talking about this passage (the land owner & what he paid to the workers) recently. I also REALLY like that the writer of the article says that our churches are partially to blame with the idea of "The Successful Christian Life" they sell. It seems to me that this is selling God short and the work that Jesus did. Simply keeping it as "if you do this, God will richly reward you" - many churches even imply that if you have struggles you must not living the true Christian life. We have fallen into that trap here in the US far too much. Thank you for blessing me today with your thoughts, dear. Dear JI, I really appreciate your comment.It true if God was not merciful we would all have perished. His free gift of salvation is for everyone who is willing to accept it.He has given us a free will to make that choice. Dear Zimb thank you for your prayers.I talked with Namrita a while ago. They are some better and a young man comes over to help them with house work. She is still away from work. Doesn 't have the strength to teach. Dear Kathryn thank you for leading me towards this post. I have pondered this question before in fact at one time I was mad at God thinking H e had not answered my prayer for healing. I also like the article on the Parable of the hired workers. Its so meaningful. P.S. Dear Kathryn, I agree with you about the misleading teaching some churches are preaching about the prosperity gospel and all round success and favor etc.It really confuses people an d turns peopke away from God when they don 't receive His favors. I know a very good sincere Christian man who could not accept the fact that he was dying of cancer. I have read your post and the book of Ecclesiastes and have seen the light. I liked the painting of the stray dogs. Here we have very few stray animals as they are immediately taken off to the pound, but we have lots and lots of humans looking just as woeful as stray dogs, as though nobody owned them, they had not been fed very well, and not had any place to take a bath or wash their clothes. Well, at least they are not being taken off to the pound and destroyed. I heard one woebegone fellow telling another old hard looking guy who lives in our complex but spent 16 years on the streets, that he is being deported, another worry now days. Guess that is next door to the pound. This a very enlightening post about the nature of God. We can only see God through our own limited and finite perspective. But He is beyond our own comprehension. That is the mystery of God. He is both transcendental (beyond the reach of our knowledge and comprehension) and at the same time He is also immanent (God is with us through Jesus Christ). God revealed Himself to us in the Person of Jesus Christ so that we may be with Him in His kingdom forevermore. But if we reject Jesus Christ as our Lord and savior, our destiny will be the lake of fire. Thanks for the post. God bless you all always. Dear ruraldiplomat from Kenya, welcome to my blog and commenting. I have read about the severe drought in Kenya resulting in a huge crisis. The whole world should join in to provide relief. Planting trees and providing a green cover is th e need of the hour. You are involved in this work and this will make a great difference. All this makes us long for our heavenly home and the new earth an d new heavens. May th e light of Christ shine on you always. Dear Gerry, your observasation is really good. Stray, homeless people are in a worse prediucament than animals. We have them travasing our streets too. Sometimes we are able to help them. Dear Mel, thank you for your valuable comment. I totally agree with you. I'm glad that your sister and family is a lil better.am down with tonsillitis again.Just can't bear this fever and chills. Dearest Nina, I said a prayer for you right away. Its the cold weather maybe that 's causing your illness. You are a doctor , but please consuklt a physician too. Its OK to voice iour feelings to God. The Psalms, Book of Job and the Book of Jeremiah is full of it. The Prophet Jeremiah calle d God names too. So glad for the continued healing of your mom... may you feel this. So right - this is what truly separates Jesus & His Word from all others. Loving our enemies. So many scriptures to contemplate. Thank Sonshine Luke 6:35 is such a powerful verse. Thank you fo r your visit.